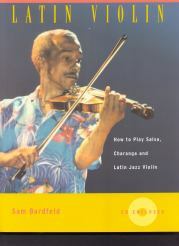 This book is written for violinists of all ages, abilities and musical backgrounds who want to learn something about playing violin in theAfroCuban tradition, known throughout much of the world as salsa or just Latin music (I am not using the broader definition of Latin music which would include important violin styles in Mexican, Brazilian and many other traditions). The book is composed of four sections: a brief historical overview of the role of the violin in Afro-Cuban music; a section on "How the Music Works" which discusses the clave - the "keystone" of Afro-Cuban music - as well as violin technique, ensemble practice, montunos, and soloing; transcriptions and analyses of solos by the seminal violinists in the Afro-Cuban tradition; and, a section that outlines the music featured on the accompanying compact disc: the original recorded versions of the transcribed solos, sample montunos, and charts for the play-along material covering different Afro-Cuban forms. My approach to writing a "how-to" book on Latin violin playing is intimated by the quotations above. Playing Latin music convincingly does not mean applying a series of jazz licks (or any other kind of lick) to Afro-Cuban rhythms (I've learned this the hard way). Nor does it mean simply applying a series of Afro-Cuban licks to those rhythms. Playing Latin music convincingly means, to whatever extent possible, immersing oneself in the music - listening to recordings, hearing it live, playing it with musicians who are fluent in the style and learning solos by the masters of the music - in order to understand what the underlying aesthetic or "feel" is. When Tito Puente made the point that there aren't a lot of jazz musicians who play great Latin music, he wasn't making an argument about essential genetic or cultural predetermination. He was simply saying that few musicians of other traditions have respected the music enough to take the time and effort to get inside it. Certainly every violin soloist in Latin music has his or her vocabulary of stylistically appropriate licks and quotes. Vocabulary is essential to soloing in all styles of music. A good solo, however, is much more than a string of licks. Like a good short story, a good solo contains not just a healthy vocabulary but also the development of ideas and themes and a convincing feel; it should tell a story.